Fregate Island is a private island named after the former abundance of frigatebirds on the island. 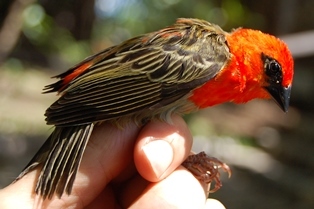 The conservation staff of Fregate Island invited me to provide a bird ringing training course in July 2015. The training involved mist-netting of seabirds and land birds. A total of 397 birds was caught (including recaptures). In the weaver family, 20 Madagascar Fodies and 162 Seychelles Fodies were caught. Most Seychelles Fodies were caught in the agricultural area, where they were feeding on ripening figs. 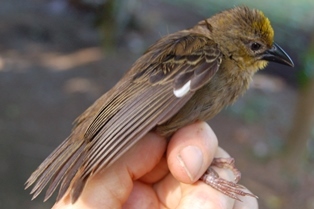 For a full trip report, see Bird ringing course, Fregate Island, Seychelles, 12-22 July 2015. Cousin Island, 18-23 September 2011. Cousin & Cousine Islands, 11-16 Feb 2014.